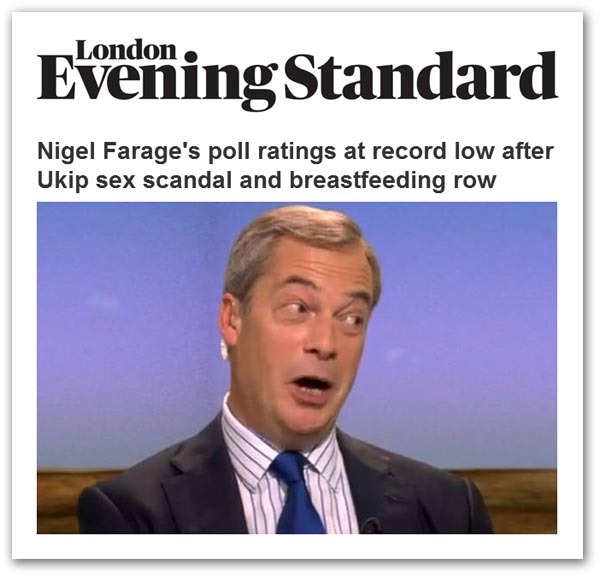 After successive Ukip train-wrecks, we are now seeing Nigel Farage's personal ratings crash to a record low in the first leader poll since the latest round of disasters. This is according to an Ipsos-MORI poll which has his net satisfaction rating plummeting 14 points since November to minus 20. Moreover, Ukip's share of the national vote has slipped for the second month in a row, down from 16 percent in October to 13 percent – according to this poll – while Conservatives lead with 32 percent, against 29 percent for Labour. The Green resurgence also continues, with the Green Party on nine percent. Farage is currently shrugging off the news, saying: "It's a volatile market". He adds that Ukip has had a pretty remarkable year, declaring that, "If we are ending on a slightly softer note, it's perhaps not surprising". But what we're getting from Ipsos-MORI, we're also seeing from YouGov which has Ukip back down to 14 percent. 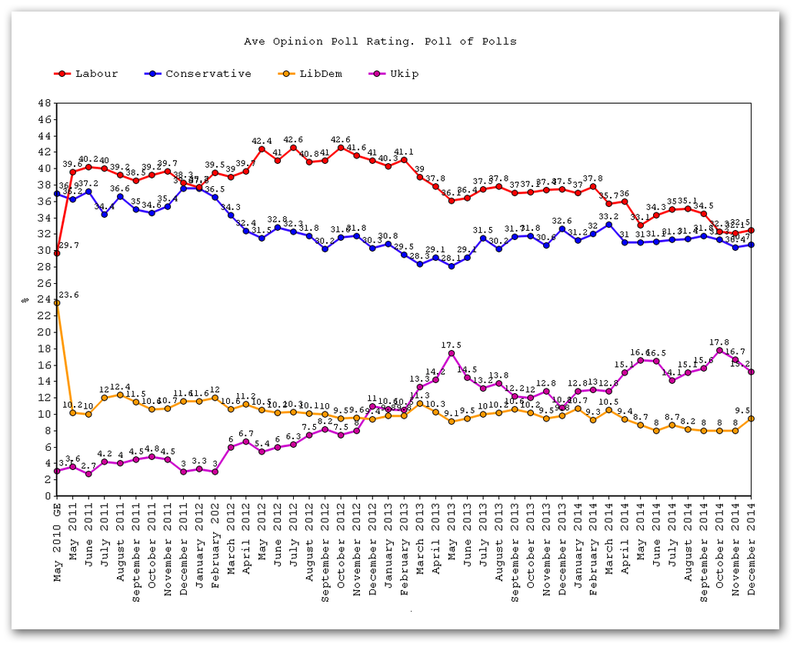 On the poll of polls, that returns Ukip to its July levels. This, however, is also the level the party was getting in April 2013, when it was in the ascendancy. Now, with three months of decline, it is looking to match the period after its peak in the May 2013 local elections. Some observe that support for Ukip does tend to be cyclical, peaking during high-profile elections and then tailing off afterwards. But that hasn't been the case since the Euro-elections, when only a slight dip was replaced by sustained growth. With less than six months to go to the general election, when Ukip should be increasing its support, things are not going well. The Evening Standard believes that the party's string of "gaffes and scandals" is finally having an effect, as indeed does the Mail. The Standard argues that Ukip will be subjected to far greater scrutiny of its personalities and policies in the run-up to the election and it is quite likely that this will result in more damaging revelations. No sooner said, with the McKenzie farce still unresolved, we have Janice Atkinson, the Ukip MEP behind the party's welfare policy, under fire for owing more than £2,000 in unpaid child support. 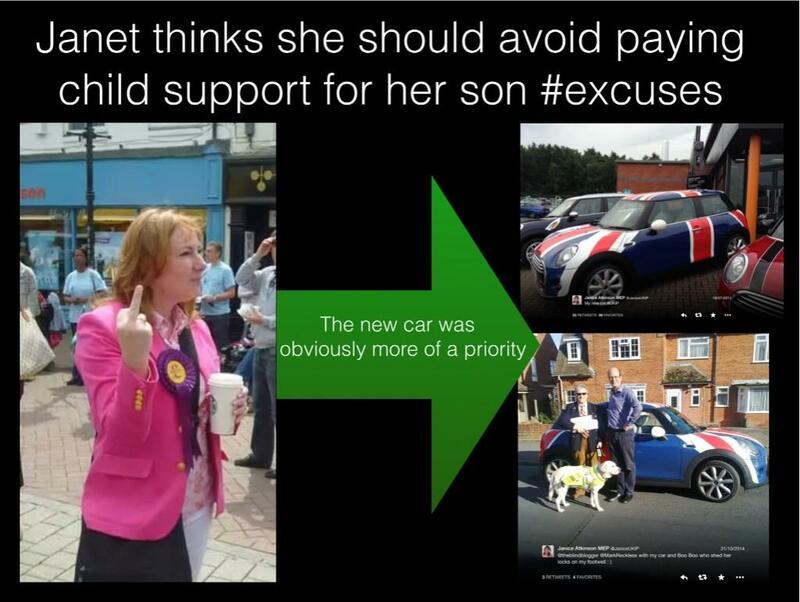 Yet this has not stopped her buying a £15,000 Mini, bedecked with Union flag colours. In terms of polling, it is far too early yet to establish a reliable trend yet, rendering the predictions of pundits such as Tim Montgomerie more than a little premature. He argues, wrongly, that the Tory battle to defeat Ukip ended last month, on Friday, November 28, when Mr Cameron gave his "big" speech on immigration. Failing to understand the nuances and the pressures on Germany, he believes that Mr Cameron had ceded the ground to Berlin, leaving the way open for Ukip to capture votes on immigration. The only hope for the Tories, therefore, Montgomerie argues, is that the Left should fracture. Even some of his readers suggest that he is "wide of the mark", and he acknowledges that there is some hope inside Tory HQ that increasing internal tensions within Ukip could bubble over. After the events of the last few weeks, that actually looks more likely than ever, potentially robbing Ukip of its electoral force. Then, it is still the case that Ed Miliband fails to convince as a potential prime minister, leading to the possibility that voters will turn away from him at the last minute. Add the carnage expected in Scotland, and there is an outside chance – growing by the day – of a Conservative landslide. This may seem counter-intuitive, but we have pointed out the effects of a two-party squeeze many times. We are perhaps being primed for a repeat of 1997, where the Referendum Party was squeezed out, by the determination to get rid of John Major's Tories. This time, it could be a revulsion against the prospect of Miliband that squeezes out a weakened and discredited Ukip, clearing the way for the least-worst option of a Conservative government. At this stage, though, the election is beyond prediction. Rarely has there been a contest so difficult to read, with so many variables. But the shambles of Ukip might at least make it a little easier to weed out one of those variables. A train-wreck party is fine for a protest vote, but general elections are serious politics, when governments are chosen. Whatever else you might think of Ukip, they are not serious politics.